It looks like something out of a sci-fi movie. A black, rectangular box with a laser-like device uses plastic to create a three-dimensional object. 3D printers are not science fiction; they are real. The devices are not available in many places, but two of them have taken up residence in Mt. Laurel. Last week, the Burlington County College’s Mt. 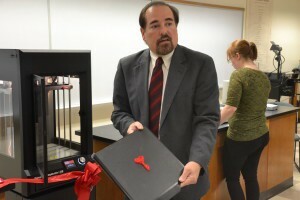 Laurel campus unveiled a 3D printer for use in classes. Defense contractor Parts Life Inc. donated the device to the school. Despite its high-tech look, a 3D printer isn’t much different than a typical desktop computer. The user creates a three-dimensional model on the computer. The printer replicates the computer model using plastic. Greg Perugini, a physics professor at the school, said the printer will change the way students work on projects. Previously, students working on engineering projects would not find issues with their design until it was completed. “Now they can print their design and see their flaws,” Perugini said. The college’s 3D printer is the latest model from Makerbot. Perugini said it is the largest model it has received yet, with the ability to make an object as large as 18 by 14 inches. BCC professor Thomas Houck said the printer could eventually be used in multiple departments and will allow the students to engage their creative side. “We’re actually going to have classes that can directly use this technology,” he said. Perugini said the college will have specific 3D printing classes beginning in the spring 2015 semester. For Mt. Laurel residents looking to try out a 3D printer, they can do so at the Mt. Laurel Library, which became one of two in South Jersey to acquire a printer earlier this year. In April, the library launched its “Make It at Mt. Laurel Library” project. The 3D printer was the centerpiece of the new program. According to Joan Serpico, the library’s manager for special projects, about 125 people attended the initial 3D printer demonstration in April. Since then, the library held four more demos, with more than 250 people participating. To help acclimate residents with the new technology, the library has had introduction to 3D printing sessions. Librarians Gina Acerbo and Stephanie Struglia have hosted these sessions on a monthly basis. The sessions include a presentation on the history of the 3D printer and a small demonstration. Struglia said interest in the printer has come from people of all ages. Getting members to use the 3D printer has been a work in progress, mostly because library personnel are learning the technology along with the members. However, the library does allow members to make an appointment and print their own objects. Library members can sign up to use the printer at www.mtlaurel.lib.nj.us. The library also holds a demonstration and an introduction to 3D printing once a month. The next 3D printer demonstration will be on Thursday, Sept. 25 at 11:30 a.m. The library is holding a Make It Faire on Saturday, Oct. 18 from 1 to 4 p.m. at the library. Serpico said the 3D printer and other maker tools will be available for members to use. There will also be demonstrations of each of these tools.